This recipe separates the dark leaves from the lighter heads of the bok choy. The heads are grilled, but the leaves are sautéed. The result is a great combination of textures and flavors. For an Asian-flavored variation, use soy sauce instead of balsamic vinegar, orange juice instead of lemon juice, and sesame seeds instead of pine nuts. Thanks to Eat Drink Better for this recipe! Slice heads of baby bok choy in half length-wise (leaves to stem). Soak in cool water for 10 minutes to perk them up and remove any grit hidden inside. While heads soak, heat olive oil in small frying pan. Add thinly sliced garlic and stir until just golden brown (about 1 minute). With a slotted spoon, remove garlic to a paper towel and take pan off heat. Take baby bok choy out of water and gently shake/pat dry. Slice off upper dark green parts of the leaves from the lighter heads. Coarsely chop leaves and set to the side. Brush both sides of heads with garlic-infused oil. Place with cut side up and sprinkle with lemon juice, salt and pepper. Place seasoned heads on grill heated to medium with cut side down. Cover grill for 5 to 8 minutes. Remove cover and turn heads over. There should be a nice golden color starting to appear. Drizzle balsamic vinegar over cut sides of heads. Cover again for 5 minutes. Remove cover and turn heads one last time back to the cut side. Remove from grill when fork-tender. After flipping the heads the first time, heat up the remaining oil in the small fry pan. When hot, add pine nuts or walnuts and toast slightly for a minute or two. Add chopped baby bok choy leaves and salt and pepper. Stir constantly until wilted, but still very green (about 2 minutes). Remove from heat. 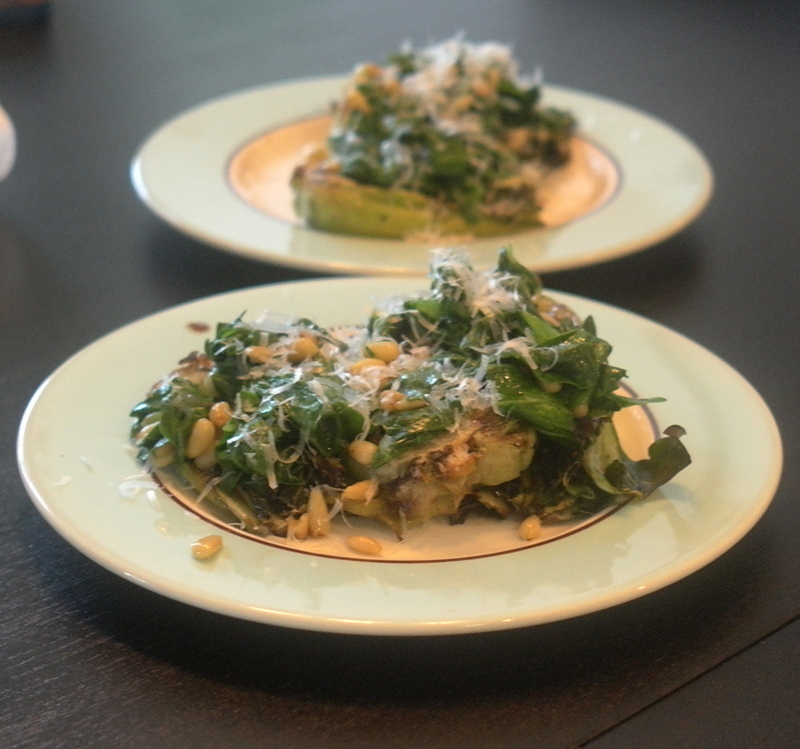 To assemble the dish, put heads on plate and top with leaves, nuts and a sprinkle of cheese. Add more balsamic vinegar if desired. I like to pack my lunch for work, but get tired of sandwiches. As an easy alternative, I will sometimes make a hearty salad to have a few bites of as part of dinner, and then take some to go for lunch the next day. Thanks to Food and Wine magazine’s August 2011 issue for this recipe. 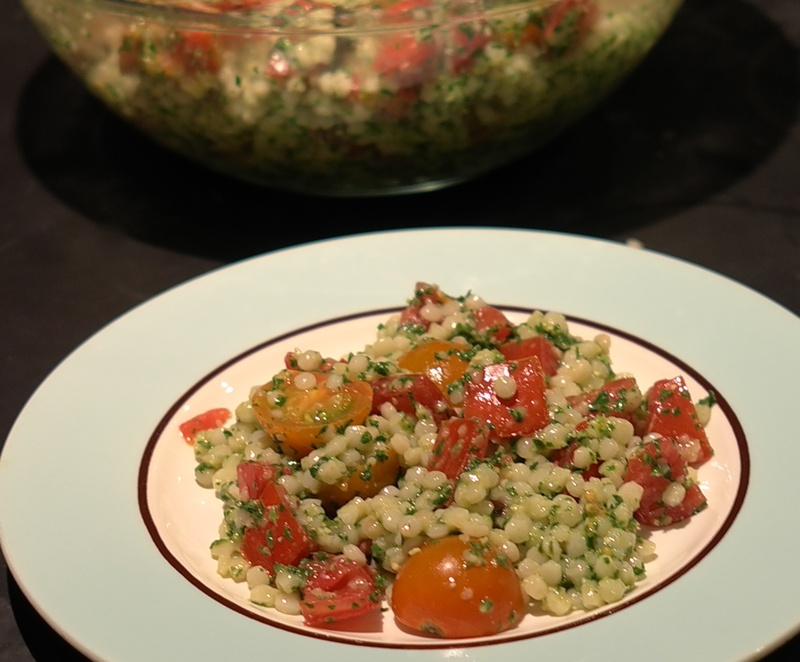 You can substitute pretty much any large grain for the Israeli couscous (such as freekah or coarse bulgur). Do you have any other creative lunch ideas? Post them below or send me a message! Bring a large saucepan of salted water to a boil. Add the 6 cups of arugula and blanch for 10 seconds. Using a slotted spoon, transfer the arugula to a colander. Rinse under cold water to stop the cooking, then drain thoroughly. Add the Israeli couscous to the boiling water and cook over moderately high heat, stirring occasionally, until it is al dente, about 10 minutes. Drain the couscous and spread it out on a large baking sheet. Drizzle lightly with olive oil and toss to prevent it from clumping. Let the couscous cool to room temperature. In a small skillet, toast the pine nuts over moderate heat, tossing, until golden brown, about 2 minutes. Let cool. Squeeze the excess water from the blanched arugula and coarsely chop it. Transfer the arugula to a food processor. 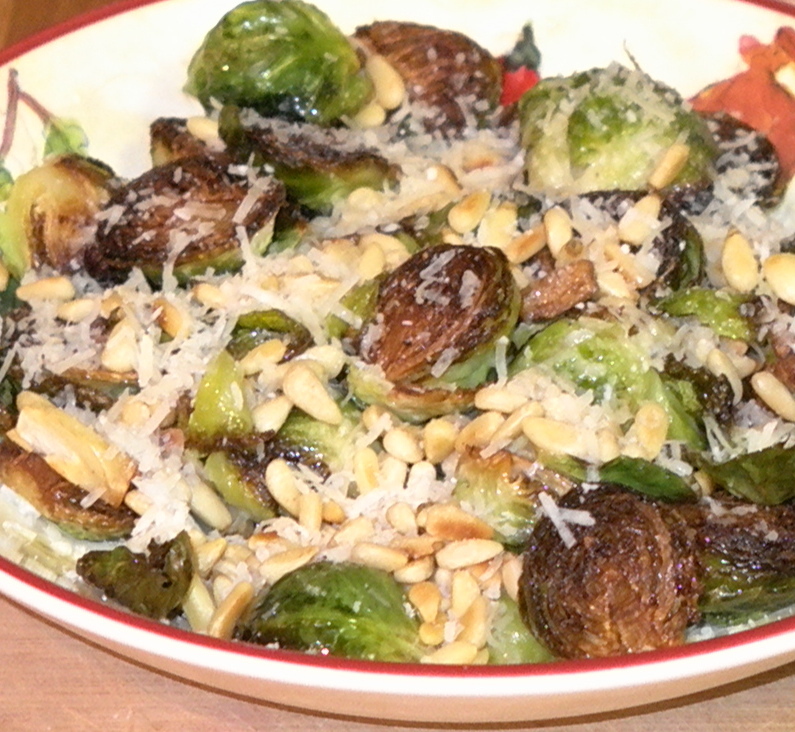 Add the pine nuts, garlic, cheese, and 1/2 cup olive oil and process until the pine nuts are finely chopped. Season the arugula pesto with salt and pepper. Transfer the couscous to a large serving bowl and stir in the arugula pesto. Gently fold in the tomatoes.